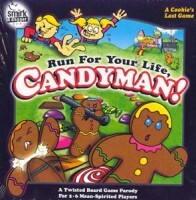 BoardGaming.com> Games> Board Games> Run for Your Life, Candyman! Yours is an enchanted land made entirely of candy and confections, but underneath that sugar-frosted veneer lies the disturbing truth. The king has betrayed you all. The sweet, candy citizens throughout the land are being packaged and shipped from the castle to voracious children all over the world. But not you. You're not going out like that. Time to get your candy buttons out of Dodge! So, it's every gingerbread man for himself in a mad dash for the border. And if you have to snap a few ginger limbs to save yourself, well...that's the way the cookie crumbles. As a child, it was safe to say I was a fan of Eleanor Abbott’s 1949 classic, Candy Land. In fact, if pressed on ways to improve the game, I could really only offer two nearly identical suggestions: death and dismemberment. Enter Run For Your Life, Candyman. If rating a game on enjoyment resulting directly from the pain of others, you’d be hard pressed to find a better game. With the obvious exception of Duck, Duck, Goose if played properly. It is nearing party game perfection. Eleanor Abbott, they have done you proud. I enjoyed this game. It’s easy to pick up due to its similarity to Candy Land and moves quickly. I admittedly spent more time trying to take out my opponents than I did trying to win, so technically didn’t do very well. However, I was satisfied with the pile of candy limbs I had collected by the end. I also appreciate that in this world a completely limbless and headless torso could somehow roll its bleeding self across the finish line. Add a Review for "Run for Your Life, Candyman!"  Run for Your Life, Candyman!